With the holiday season at hand, young party planner Jennie Stanton learns that her boss, Petra, will be retiring after Christmas and hopes she will be left in charge of Petra’s Parties, New York’s premiere event planning service. Jennie’s hopes fade when Petra’s charming and handsome nephew, Nick, arrives on the scene and Petra announces that he will take over the business. When an opportunity to plan a toy store’s Christmas Eve party arises, Jennie runs with it, arranging a warm and traditional affair in the same vein as the Christmas parties that inspired her as a child. As Christmas Eve approaches, will Jennie open her heart to find love for the holiday? “Best Christmas Party Ever” is a terrific Christmas movie that is fun to watch any time of the year. It deals with themes of overcoming misunderstandings and following one’s heart. 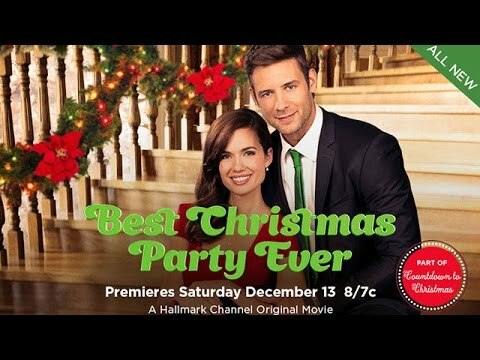 Party planner Jennie Stanton (Torrey DeVitto) is well-liked and experienced and hopes to take over the reigns when she learns the owner of Petra’s Parties, Petra herself, is stepping down and is about to hand the reigns to someone else. However, Jennie is shocked and disappointed to learn that the young man she is asked to train, Nick (Steve Lund), Petra’s nephew, is the one who will eventually run the business. Jennie and Nick clash several times as they attempt to work together, but Jennie learns that they actually compliment each other: He is great in coming up with ideas and she is great at implementing them. Nick begins to date an old friend, but he and Jennie obviously become attracted to each other. Nick salvages a major disappointment that Jennie faces and she soon can’t figure out how she’ll get along without him when he accepts an acting job on a soap opera in another state. Is it possible he might change his mind? This film is comedic and witty and features two likable leads and a realistic, yet imaginative, plot. We are pleased to award it our Dove Family-Approved Seal for ages 12 plus. “Best Christmas Party Ever” will be one of your best viewing experiences this Christmas.